Flushdyke Station was the first station to be opened in Ossett in 1862 as a temporary terminus of the Bradford, Wakefield and Leeds railway. The line extended to Ossett and then on to Batley in 1864 when the line was doubled throughout. By 1883, Ossett had three railway stations: at Flushdyke, Ossett and Chickenley Heath, all on the Wakefield, Batley and Bradford branch of the Great Northern railway. 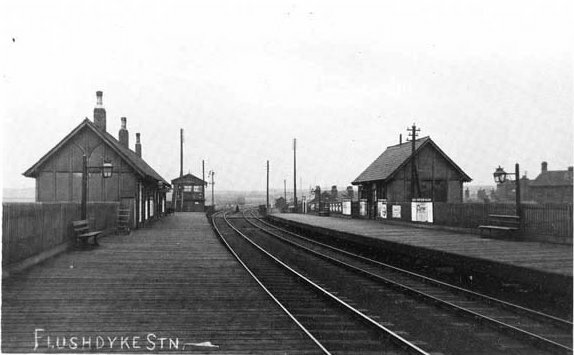 Flushdyke station finally closed in 1941. After cuts by Dr. Beeching in the 1960s, there are now no railways stations in Ossett and it is said that Ossett is the largest town in Yorkshire not to have its own railway station.